Gleamworks offers premium detailing in Vancouver and Richmond. Book an appointment. We’ll inspect your vehicle and make recommendations. Welcome to my detailing shop! I’m Igor, owner of Gleamworks Detailing & Ceramic Coating in Vancouver. I’m an authorized Opti-Coat installer and the lead detailing and paint correction technician. I grew up in Eastern Europe in the late 90s – a time when having a car was considered a luxury for most people. Back then, people who could afford their own car treated them with great care and maintained them inside and out. Because having a car was a privilege, car owners treated them like any valuable asset – with great love and attention. I was taught the value of a good vehicle, the beauty of a well-maintained, clean interior and exterior. My respect and love for cars grew from this experience. When I got my first car, I treated it with the same respect. I spent a lot of time ensuring it was running well, well-maintained, and, of course, I also wanted it to be clean and have a flawless shine. When my car got its first bad scratch, I brought it to a body shop. I wasn’t satisfied with result, because I wanted it to be perfect. This experience started my interest in auto paint correction. My first professional job was in a Subaru Centre in my home city. I met many car enthusiasts, such as professional racers, who shared my passion. They worked on their cars together as a team and I learned a lot from what they shared with me. I worked at the centre part time while I learned my trade. My study of paint correction and auto detailing techniques continued for a decade. Then, in 2007, I began working full-time as a professional paint correction technician and auto detailer. Several years ago, I moved to Canada, a country I’m proud to call my home. I started my own premium detailing business just a few years after arriving. I wanted to understand the market, quality standards, and the best products, so I met suppliers and other paint correction professionals in Canada and the USA. I was invited to a Louisiana detailing event and met other professional detailers who shared my values, ideas, and endless quest for perfection. Soon after meeting, we opened a detailing shop in Richmond, BC, where I worked for several years. We attended countless trade shows and events in the USA, including the National Viper event hosted in Las Vegas where our large team detailed over 100 cars in less than a week! Business grew fast and as a result, the shop’s capacity reached its maximum. This presented an opportunity for me to branch out on my own. Welcome to Gleamworks premium detailing in Vancouver. Our new shop is twice as big as our old shop and conveniently located in Vancouver near Southwest Marine Drive and Oak Street. The location is perfect for Vancouverites and very near our Richmond clients. There are many detailing shops in Metro Vancouver, but very few match Gleamworks experience, dedication to craft, and passion. 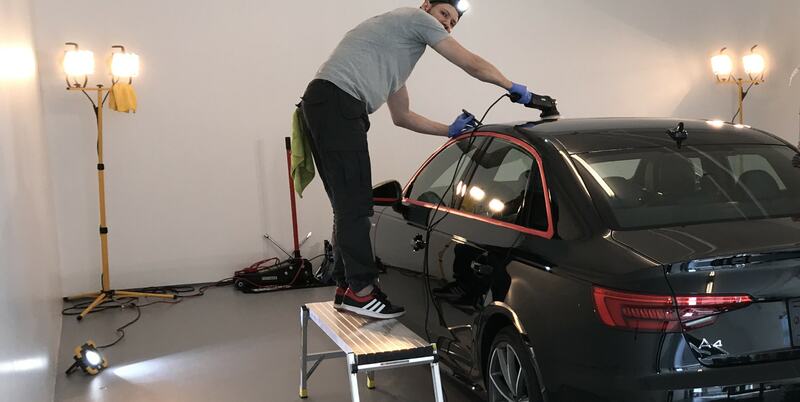 Our goal is to achieve a new level of detailing, paint correction and ceramic coating services in Vancouver. Gleamworks is the only certified and authorized Opti-Coat ceramic coating specialist in Vancouver, BC. We bring the most advanced products, techniques, attention to detail and love of car aesthetics to every job we do. We want our work to add some sparkle to Vancouver traffic…one car at a time! Gleamworks Detailing & Ceramic Coating.